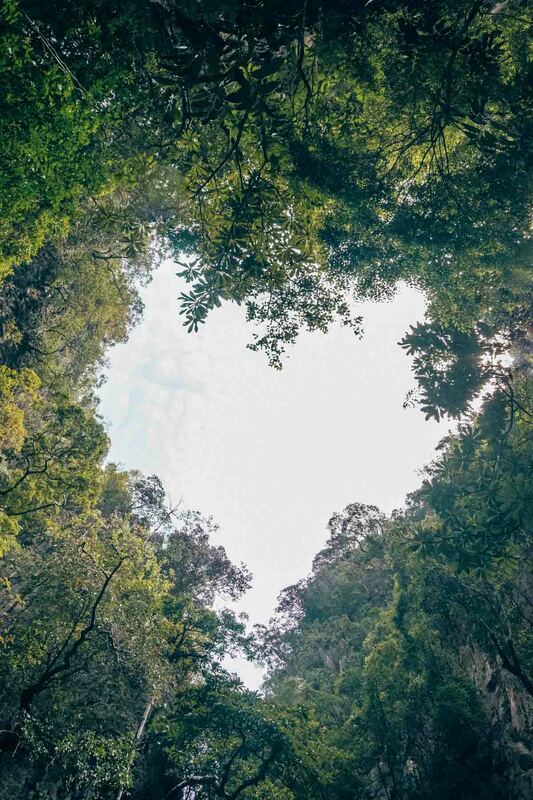 Even if it seems as the most touristy thing to do, I sincerely recommend taking one of the organized trips to Ao Phang Nga National Park. Ao Phang Nga is located in the southern part of Thailand, along the Andaman Sea, in the Phang-Nga province, a little more north of the east coast of the island of Phuket (yes, Phuket of which they say you should avoid if you do not want the bunch of tourist and crazy parties, even those with boys/men dressed in women). 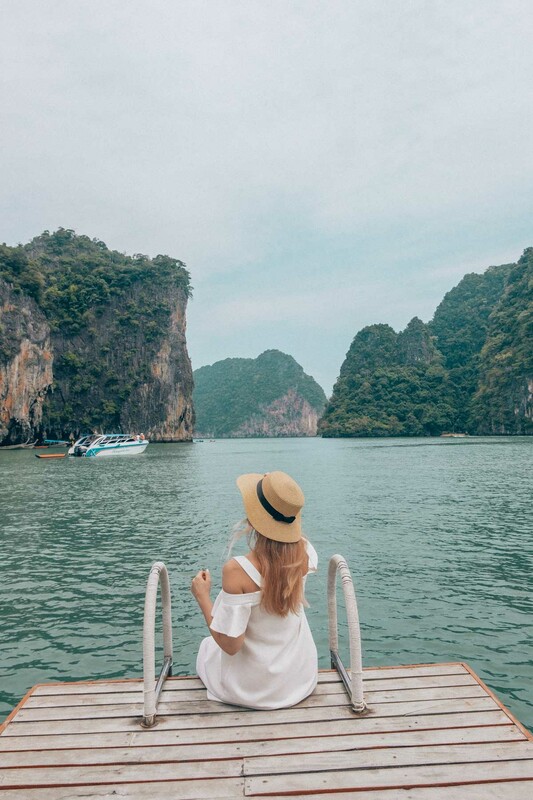 From the Royal Phuket Marina, Jan and I took a high-speed boat (under the guidance of an experienced skipper of course) and sailed away to the beautiful area called Ao Phang Nga National Park. 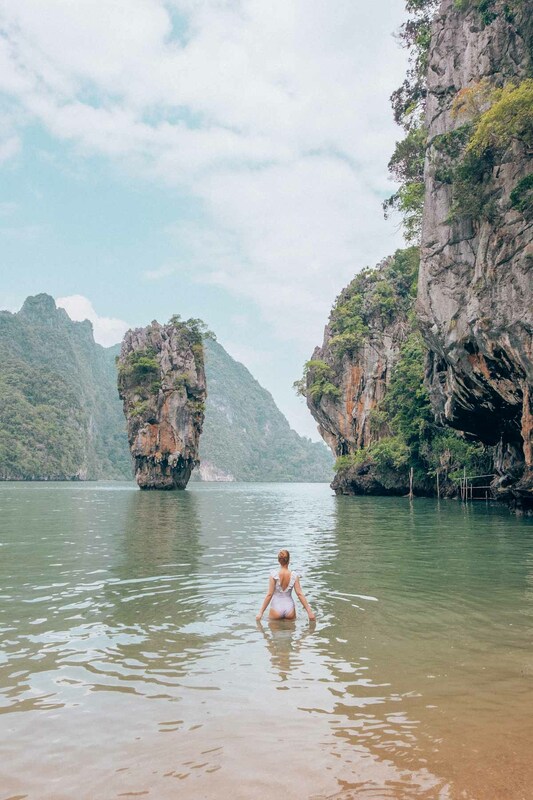 The high limestone sculptures, shaped by nature, are inviting with its wonderful and (despite the exceptional popularity) unspoiled placement in the emerald green sea. 20 minutes from the Marina we stopped at the island of Panak, a popular kayak point. 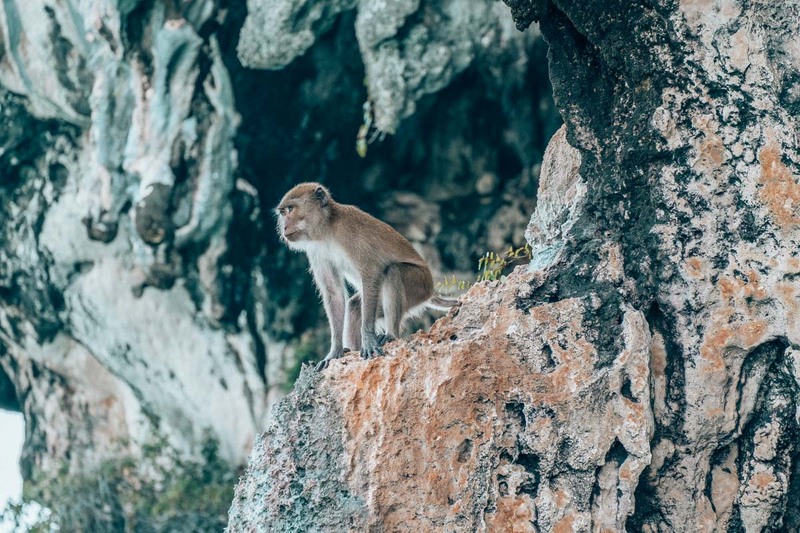 While we waited for our kayak ride, the monkey who gladly accepted the banana we threw, welcomed us from the rock on the sea. For the first time we took a closer look at limestone islets, overhanging walls and small sea caves. 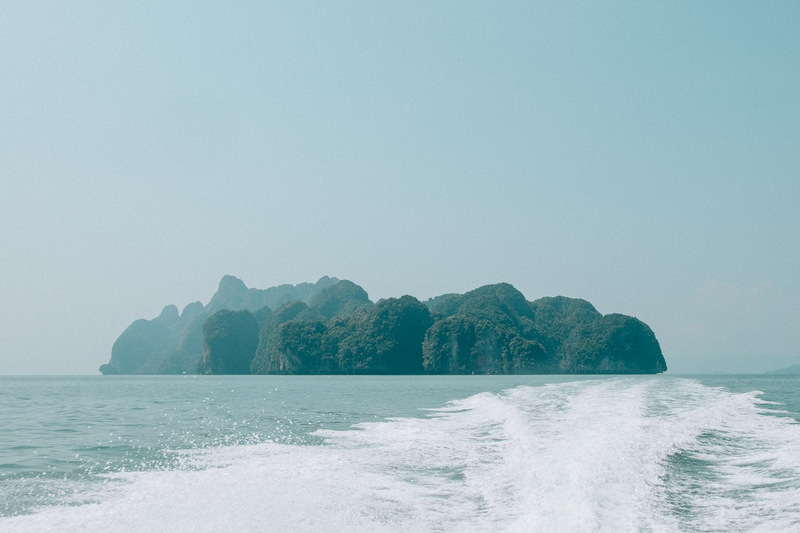 Koh Hong (the one in the Phang Nga National Park, not the one at Krabbi) was our next stop. There we landed on a raft, where we were welcomed by trained kayakers. In pairs we sat in kayaks (I sat in front, of course), and behind us sat the master who drove us around a cove, stopped when we wanted to take a photo (he also directed the kayak in the desired direction), drove us to the overhanging walls and in small and dark caves. 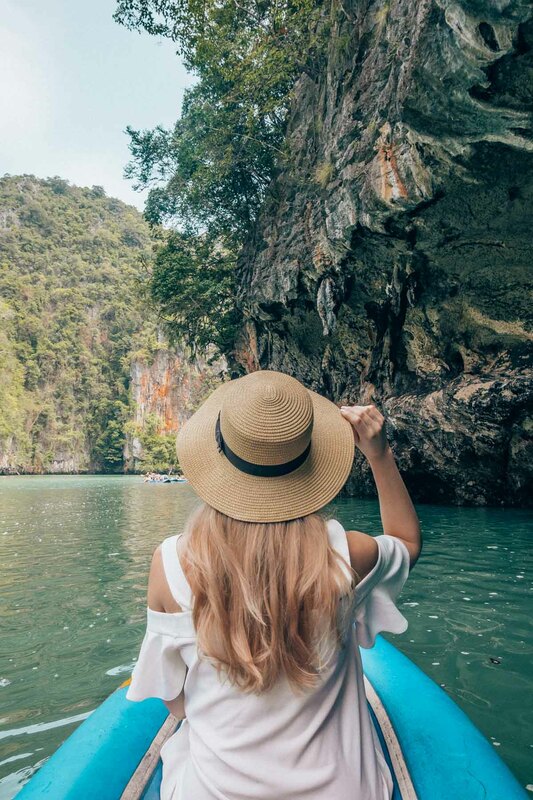 On certain excursions you can drive the kayak yourself, but it is true that if you let the kayak master drive, you can easily hold a phone and a camera in your hand (without worrying about dropping it into the water or getting it wet). 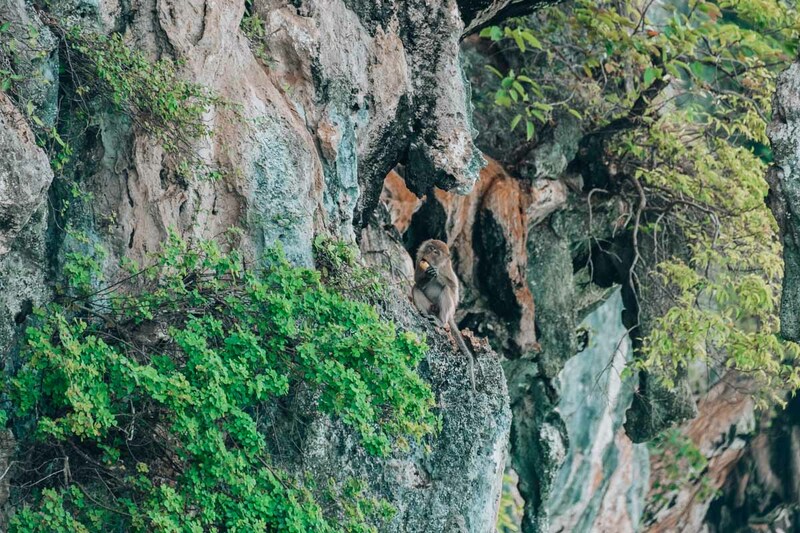 If you look closely, you will see bananas, turtles and elephants on limestone walls. Not the real ones, but the ones that the Mother Nature shaped from the limestone. 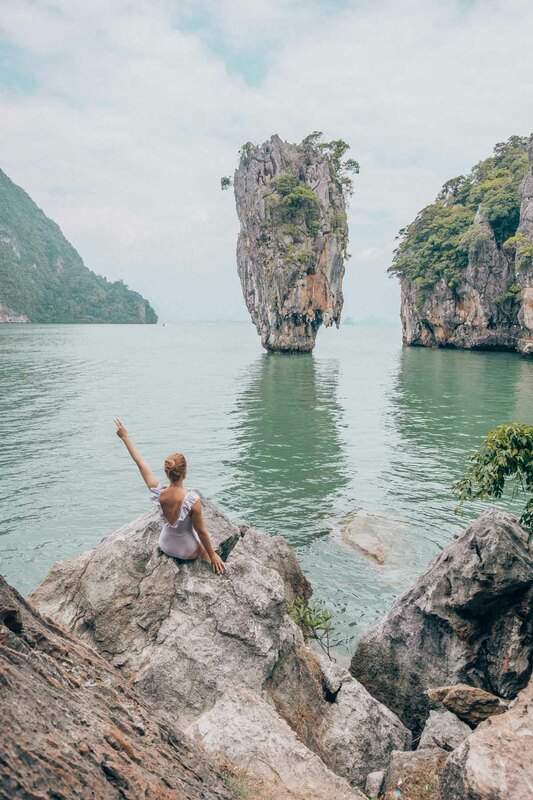 The island, whose real name is Khao Phing Kan, is today known better as the James Bond Island. 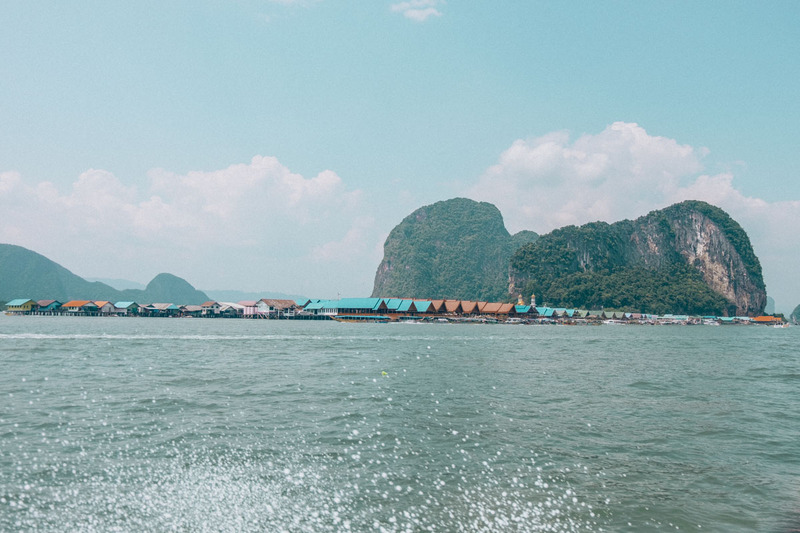 Why it was chosen as a venue, becomes clear soon after your boat approaches the island – it offers an epic view of the beautifully formed high islands of limestone that rise from the emerald green water. 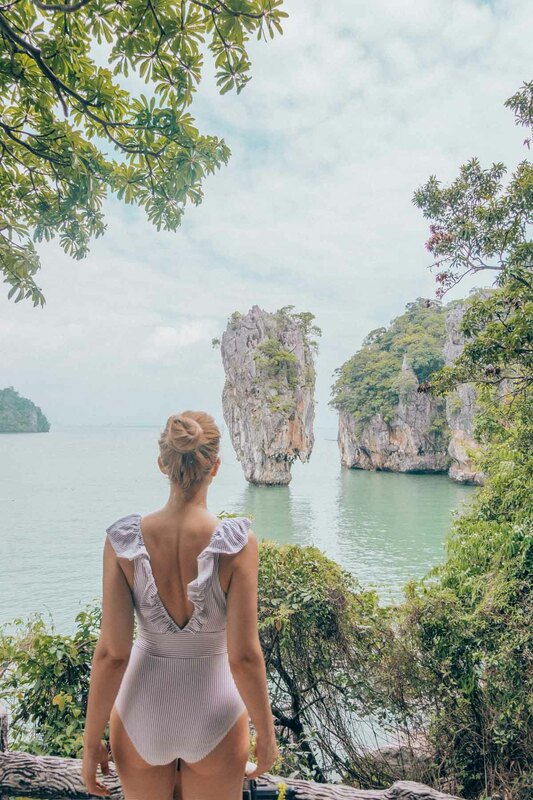 Although it is an exceptional tourist spot where tourists gather all day, a photo without people in the frame (like my first shot of Phang Nga park on Instagram) can be taken (without Photoshop!). The man with a gold pistol from 1974 thus brought eternal glory to the island and regular tourist visit. It is a wonderful islet, which is despite the tourists worth a visit. 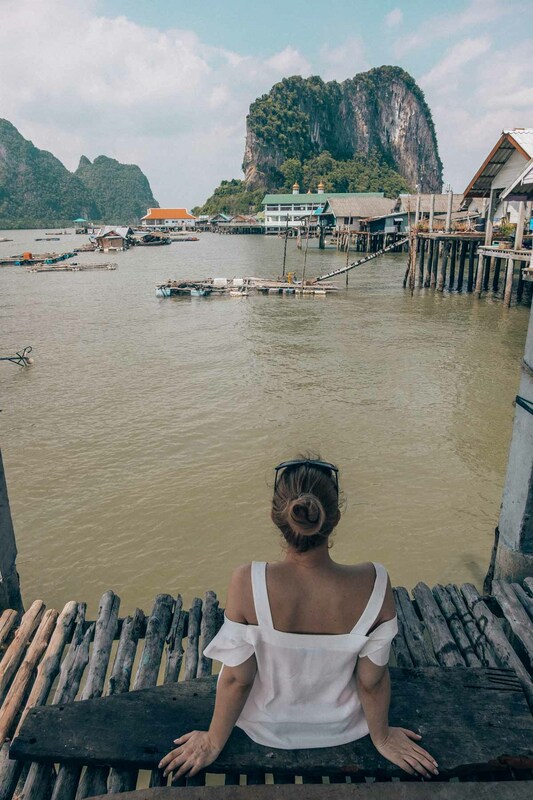 Although it may not be as fascinating for us, living 2 hours from Venice and know the history of crannog-builders in the Ljubljana basin, there is a village in the middle of the Phang Nga, located just above the sea level, which gets dangerously high during the rainy season. The village was set up and settled by Muslim fishermen from Malaysia in the 18th century in an area that was ideal for fishing. Today, there are about 1500 people living there, their life is strongly influenced by tourism, yet they remain living in those houses at sea and still fish. We stopped there for lunch, Jan and I quickly walked along the streets and were pleasantly surprised that they were not only selling souvenirs, but they also had a school, an ATM, a hospital, a mosque and a football field there. Yes, you’ve read that right. Football field. It was built in 1986 and their team is considered one of the best junior teams in southern Thailand. On our way back to the marina we stopped at the smaller Naka island – the island of Naka Noi. There we were greeted by a sandy beach and turquoise sea. The boat was anchored at a manmade beach with deck chairs, bars, water activity facilities (such as a water scooter and a parachute ride on a fast boat) and people carrying little monkeys and iguanas in their hands, ready for photoshoot. We preferred to head south and after a few minutes’ walk we found a beach that we had practically for ourselves. 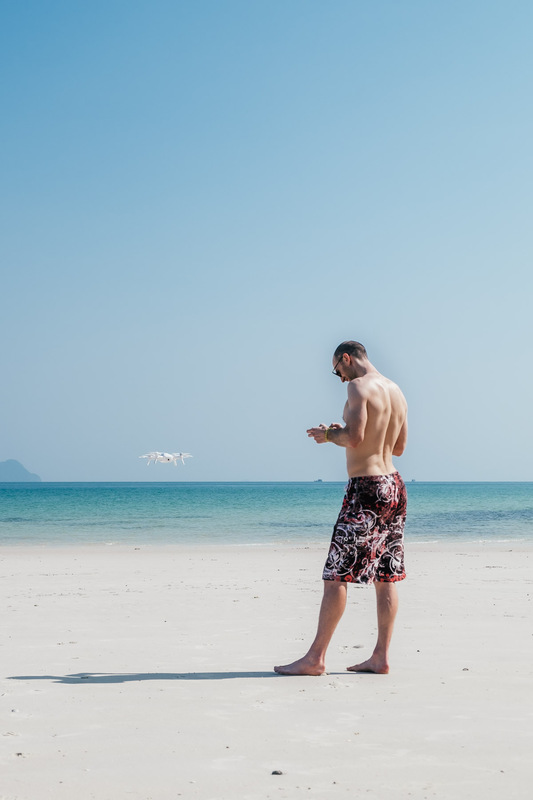 There, for the first time in Thailand, we sent the drone into the air, soaked in the warm sea, and enjoyed looking at the turquoise background. 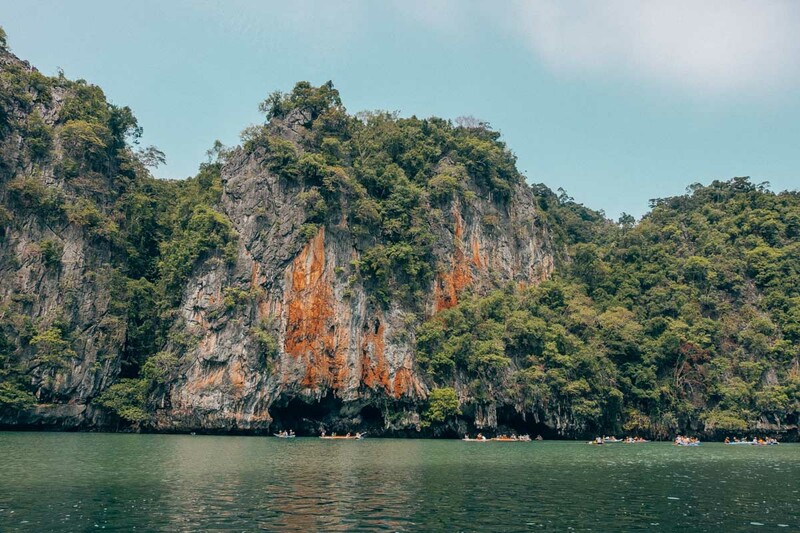 A trip to Phang Nga National Park with a fast boat will take you one day and about 50eur. During the full moon, the journey back to the marina is especially interesting – the tide is so low that the boat can hardly ride across the shallows. Memories will stay forever. 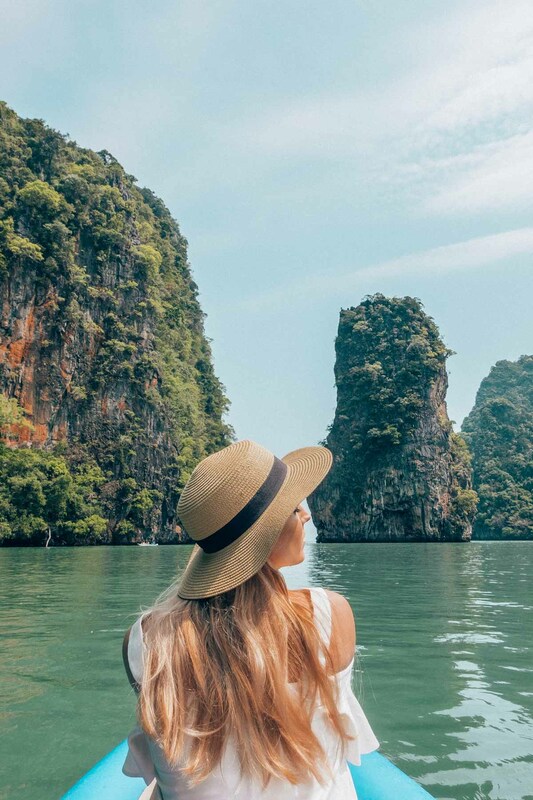 I recommend that you opt for a fast boat trip, as you will see more (also the price is not much higher than a trip with a regular, slower boat). We took a trip with Crystal Sea Marine, where everything was included in the package (excursions, activities, food and drinks – lunch buffet on Paynee Island, water, juice and Coke were always available, and at the end they spoiled us with juicy pineapple and watermelon). Probably your excursion includes not only transport and activities, but also food and drinks. Still take some money for souvenirs, tips for kayak drivers or ice cream in the Panyee village. A camera (with a full battery) is a must, because you will be sorry if you don’t take photo / video memories to remember back home! Be relaxed and have fun (not that you need to plan this, it will just happen spontaneously)! This is such a great blog post. I’m going to Krabi in 3 days so this is super helpful. I’m just wondering but how did you manage to get your James Bond island pictures without any people in it? Dear, taking a picture without any people in it, it is actually not a problem. No one was in the water when we came, people were only on the island. Also, there will be a lot of different posts from Thailand also in the future.